We set Feburary 8 as the move-in date for the little apartment in our basement of our as yet unfinished house. One and three quarter years has passed since we lost out home to wildfire. We lost hundreds of years history. The history was our families and it was of people from around the world. We lost part of the world’s legacy for the future. In our house that was consumed by the hungry fire was a lifetime of collecting antiques and special things. It was more than a lifetime, really since we had things from our mothers and our mother’s mothers and their mothers. My mother collected antiques. I had been with my mother when many of the things that lived in our home came into the family. She and I shared a passion for seeing and preserving the physical things that told the tales of our forebears. Together we supported his love of history and imbued into my spouse a love for antiques too. Just between the three of us, when the fire came, we lost over 120 years of collecting. We collected simple things. We collected things that were not seen by others. In junk stores and at auctions most people passed on by what we put into boxes and brought home. We collected things that were pieces. As we put them back together we found their stories. We collected broken chairs and torn books. We collected old textiles and dishes that others had eaten from. We had scores of hurt baskets retrieved from the brink of destruction. To most, a basket is considered un-valuable when it is hurt, when it sustains damage. It was not worth saving. Except to us. Baskets may seem trivial but we had them living with us in our home. Among the many we had one large basket made by Eastern Woodland Indians in the early 1800s. Its maker made it as a utilitarian storage basket. She also decorated it. You could still see faintly the decorations stamped on its splints using designs carved into potatoes for stamps. That baskets had a story to tell. All of the baskets told of the stories of the people who made them and how they used them. The little hand carved hand carved train from the 1800s that lived in our guest room asked me to remember its story. I could only tell that it was hand carved in New England with the greatest of care. Perhaps a grandfather made it for his grandson. Who knew how many children played with it in 200 years. I know several who played with it in our home. Who knew how many people protected the train so that its paint stayed fresh and clear. Who knew if it was in such fine condition because no one cared about it and it stayed jammed in the back of a closet for a century. We had illuminated manuscript pages from Christian monasteries dating back to the 1400s. Their story was written on their pages. We had pages from the Book of Hours which was a text celebrating their faith through singing and praying eight times a day at prescribed hours. The manuscript pages we had included two chants for matins and there was a page from a lesson book that showed one of the Bible lessons that were read. The chants for matins, while not as ornate as the lessons, were particularly cherished by me. My spouse loved the intricate gold and blue and red of the lessons page. The first letter, a P, written in real gold, sprawling from the first line down the side of the paragraphs nearly to the bottom of the page. There were scrolls and flourishes. Inside those were tucked little lions and gargoyles. My attraction to the pages from the daily offices for Matins was driven by respect and amazement for people who committed themselves to a monastic life, people who prayed 8 times a each cycle of 24 hours, ever day, for the rest of their lives. They did not pray when it was convenient but to mark the hours of their day on this earth. Matins is the first service of the day. It is the service that marks a person’s life passing safely from one night to the next day. The division of day from night was traditionally set at 2 am. Monks and nuns who had toiled in the fields or taking care of the poor or preserving the written word in scriptoriums or being in prayer for the world all day arose at 2 am to sing praises to their Lord. We have spent time in old abbeys and monasteries, once even staying for in one for 10 days over Christmas observing a modern version of the hours. The old stone buildings are mightily cold. It is not just the lack of heat but the months and months of penetration of the cold into the thick, old, stone. Singing even when you have the benefit of LED torches with fleece and down jackets is a challenge. Paying attention is an even greater challenge. Like the monastics before us, sleep and cold overtook us and we drifted away only to be awakened by the sharp jab of the person beside us reminding us why we were singing at 2 am in a cold stone church. The pages from the book of hours. Who held them? Who sang from them? What monastery was home to this valuable hand-copied book? Who took it apart and sold it page by page? With my one page was I properly respectful to the history of that page? Our home was full of things that told stories. It was full of history. It was an archive of American history c. 1720 to 2012. It archived, too, of some of the things that contributed to how the history of the US was formed. Those books from which our manuscript pages came were valuable to the monasteries, safeguarded and used for decades and even centuries of monastics. Perhaps a monastic who sang from them two centuries after they were first copied traveled to the “newly discovered” Americas to “Christianize the Indians” bringing European diseases that devastated the indigenous populations. Perhaps the person who sang old Book of Hours was part of the Christianization effort who conveyed their understanding of the mandate of Christ’s love not by hammering scripture and forcibly revoking traditional practice but by nursing the people who fell prey to the European diseases. Did my Eastern Woodlands Indian ash splint basket with potato stamp decorations belong to someone who had been “Christianized?” Did the carver of my train hold up Puritanism up for a model? Were these people intertwined; Indians and European settler colonists? Undoubtedly they were. The stories of simple things like baskets and children’s toys are always intertwined. They speak of love or of need. They speak of risk and of danger. They speak of having and of loss. The baskets, manuscript pages and a child’s train that lived in my house filled my house with their stories. The hungry fire that ate my house consumed more than logs, nails and paint. It consumed the voices of people whose possessions lasted centuries after they passed from this earth. Losing, before I pass from this earth, the things that would usually be left behind when I die, feels akimbo. Because of the fire I am not leaving a behind legacy for future generations, I lost a legacy for future generations. Even though I could not have stopped the fire, the grief and sorrow that attends what feels like a betrayal to the future will always be with me. But the legacy I leave is not that. The legacy I leave is having treasured those things. It is telling the tale of the people who were connected to those things. I am one of those people. I can tell my tale and I can leave my legacy of respect. Our beloved hand carved train is in the center back of this image. Beside it are reproductions of 18th century Chinese import ware. Above the picture is a Bible page from an early Gutenberg-style press. The chair with its hand-woven splint seat is perhaps 100 years old. It is in the Shaker style and hails from New England. The chest by the chair is circa 1880, The finish is rubbed black with age. The edges are worn smooth from use. 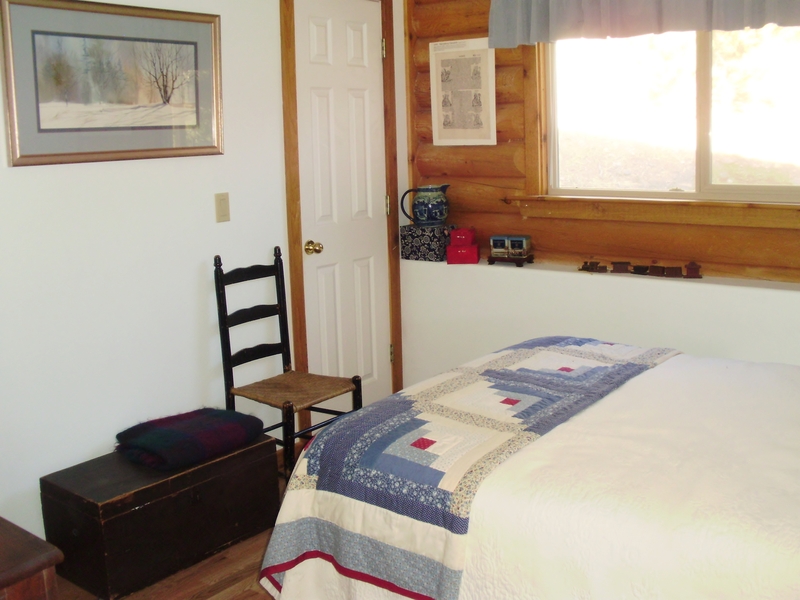 The Log Cabin quilt was only 30 years old but made by elderly ladies who had learned from their mothers the centuries old quilt pattern. The painting on the wall was from the 1970s painted by a named artist whose work was almost always commercial. This was from the artist’s personal collection. He sold it to my Mother because she greatly admired the painting as did we.